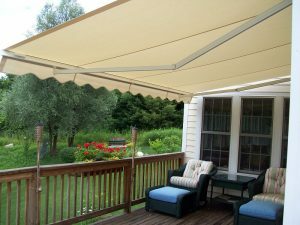 A patio awning that retracts when you want it to can be a terrific addition to the outdoor living space at your home in Southampton, New York, or a nearby community. After all, you might want to decorate your patio or deck with plants that need a few hours of morning sun but crave shade the rest of the day. Or, you may want to sunbathe on your patio during the morning hours but roll out the shade during the hottest part of the day, thus cutting the amount of solar heat that enters your home through the windows or glass-paned doors. That can help you stay comfortable indoors while reducing your utility bills and the strain on your air conditioner. In any case, whatever your reason for wanting to control the shade, a retractable patio awning from Sunesta can help you do it. What’s more, we can help you do it in style. Sunesta custom-manufactures every awning to precise measurements, and offers homeowners more than 150 fabric design options, including solid colors and stripes. That’s a selection that’s among the best in the industry. In addition, our retractable awnings need no support poles and can enhance the look of a home with complementary colors. For more information about a custom retractable patio awning for your home in Southampton, NY, or another nearby community, contact Sunesta today. We’ll be glad to provide options that will put you in charge of the shade.